For more information about FalconView, please contact John Pyles, Principal Research Scientist. An American pilot overseas sits at a laptop computer, using a specialized mapping software program along with late-breaking intelligence to plan an upcoming combat mission. At a stateside surveillance center, an intelligence analyst is running the same software on a desktop PC, tracking a suspicious vehicle at a U.S. border. And half a world away, the mapping tool is helping the pilots of a massive military cargo aircraft navigate home. Using a single software program for a broad range of mission planning, mapping, and surveillance tasks isn’t a new concept. It’s a strategy that U.S. forces and agencies have followed for two decades, and it’s become an essential part of multiple military and intelligence operations. Consistently, the core software used is FalconView®, first developed in 1994 by the Georgia Tech Research Institute (GTRI) for the U.S. Air National Guard (ANG). FalconView Mobile extends these capabilities to tablets and smartphones. In addition to Windows, the new FalconView versions will run on a variety of other operating systems. The work is sponsored by the U.S. Special Operations Command (USSOCOM). The FalconView of today serves as the interface for a varied group of mission planning software tools known as the Portable Flight Planning System (PFPS), the Joint Mission Planning System (JMPS), and XPlan – all of which analyze and display vital geographical data. For the sake of convenience, users often refer to the graphical portion of these tools as FalconView. 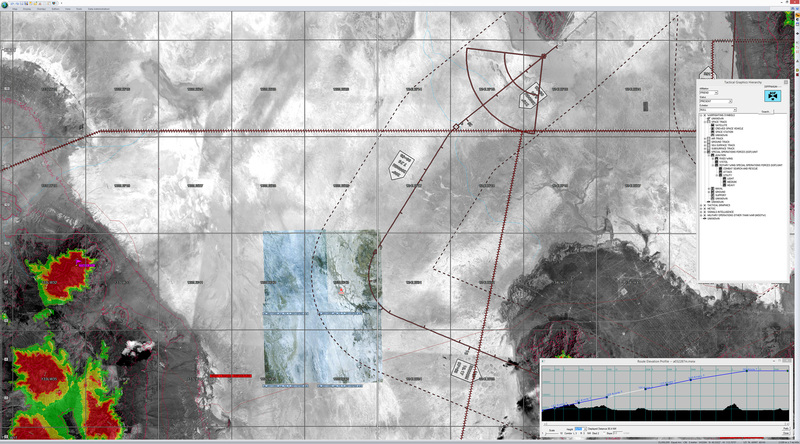 FalconView can display many types of maps, including aeronautical charts, satellite images, and elevation maps. It also supports multiple types of overlays, allowing them to be displayed and printed over any map background. Combined with global positioning systems (GPS), FalconView supports the use by aircraft of moving-map displays, which are more complex versions of now familiar consumer applications in which a symbol representing a cellular phone or other GPS device remains stationary on a display screen while a route map moves underneath. FalconView can also aid combat operations by displaying incoming tactical data in real time. FalconView 3-D is designed to give surface-based military units an improved battlefield perspective. Unlike the traditional 2-D version of FalconView, which was developed primarily for aviation and other bird’s-eye view applications, FalconView 3-D can give those operating on the ground or water a first-person view of the surrounding area, complete with incoming intelligence data that updates the battlefield situation in real time. This 3-D capability, Millard adds, is important to surface forces as varied as Army and Marine infantry units, tank units, and naval vessels – even Navy SEALS. Compared to a two-dimensional view from above, it can give them a more intuitive picture of their situation. FalconView Mobile has the potential to support both aircraft and surface units. It brings the core features of FalconView 2-D and 3-D to highly portable tablets, considered easier to handle than laptops by many users. FalconView on a mobile device can be an important tool for surface units engaged in missions, Millard said. It provides ready access to graphics that show combat situations at a glance. Moreover, tablet computers can provide those in the field real-time access to intelligence that predicts probable enemy behavior. 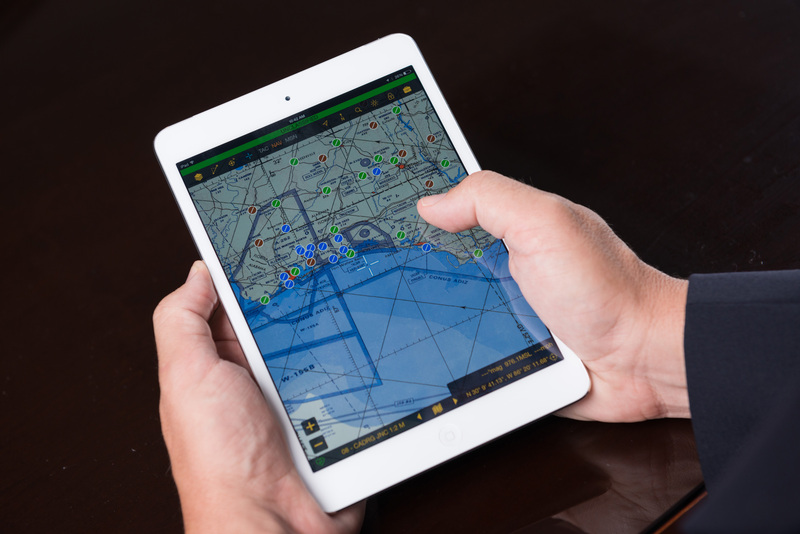 Adapting FalconView to tablets can also benefit aviators, Millard explained. Mobile computing devices are currently replacing a time-honored pilots’ tool: the black flight bag. This bulky item is typically stuffed with emergency manuals, maps, and other reference materials. Now electronic flight bags, consisting principally of tablet computers, are taking over in both the military and civilian arenas. Delta Air Lines, for example, recently announced it was supplying all its pilots with tablets. The tablet computer’s ability to carry reams of electronic documents is important, as is its lighter weight. But its biggest advantage lies in being able to provide the latest versions of its vast electronic library. Acting on a request from the ANG, GTRI completed the first FalconView programs in 1994. The original GTRI development team – led by John Pyles and including Rob Gue, Jim Rhodes, and Vinny Sollicito – produced the first FalconView PC version for the MS-DOS operating system, followed shortly by a Windows 3.1 version. Pyles said the idea for a mission-planning program that would run on the familiar PC came from a pilot named Bobby Sandford, then a captain in the ANG. Sandford wanted basic software that would give him and fellow F-16 pilots in the ANG a convenient, lower-cost alternative to the then dominant Unix mission-planning platforms. The initial version of FalconView – named after the “F-16 Fighting Falcon,” the fighter’s full name – was a set of routines that displayed scanned maps with simple stick routes drawn on top. Improved functionality followed, as the product was fleshed out by collaborations between the GTRI development team and mission planners who soon adopted the software as part of their daily activities. As FalconView matured, USSOCOM adopted it as the framework for the entire PFPS. Important capabilities were added such as moving-map functionality, which shows aircraft location dynamically and helps provide pilots with hands-off navigation. In 1997, the Air Force adopted PFPS, followed by the Navy in 1998, and the Army in 2002. Working with the military, GTRI gradually upgraded the program to support many platforms, including transport aircraft, helicopters, naval vessels, unmanned aerial vehicles (UAVs), and PC-based intelligence operations. Today, FalconView utilizes a range of programmer interfaces that lets multiple applications combine their information into a single coherent picture of a user’s area of interest. Moreover, the existence of the widely used FalconView standard helps users share data with other branches of the armed services and with coalition partners. FalconView users continue to influence the program’s list of features, said GTRI researcher Menhorn. 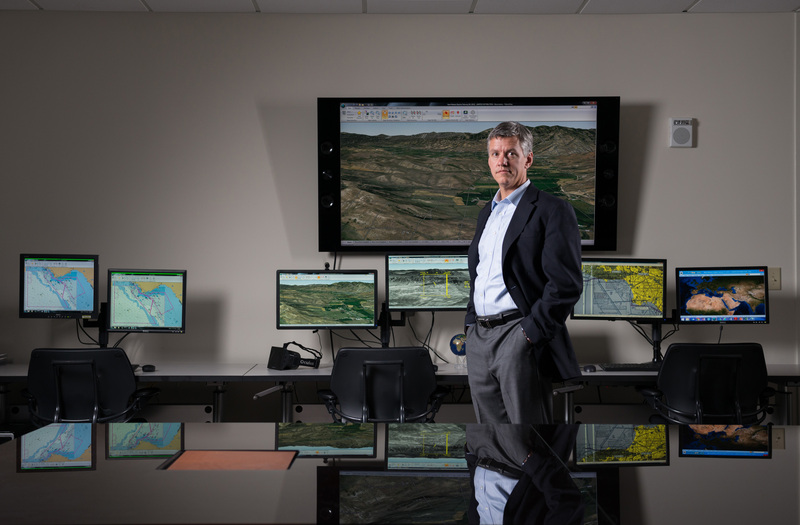 In some cases, he explained, pilots or intelligence analysts will spot a function they like in commercial flight-planning or geospatial programs and then request that it be added to FalconView. GTRI is currently porting FalconView to a variety of platforms, in addition to Windows. These platforms include Apple Computer tablets, which use the Apple iOS operating system, and several tablets and smartphones that use the Android operating system. A version for the Linux operating system is also being developed. 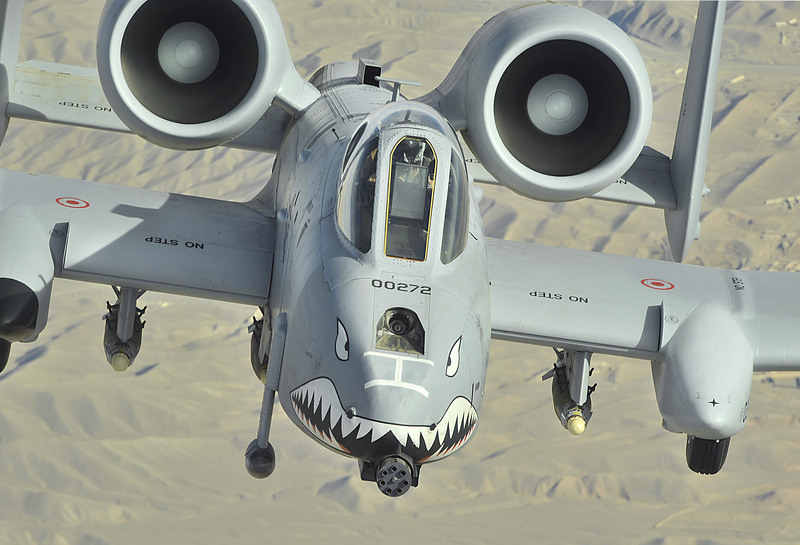 The new versions will be solely for use by the U.S. military and allied nations. An open-source edition of FalconView exists; it can be downloaded by registered users in certain countries, but this edition has reduced functionality. Development plans call for FalconView to become core to the main framework of the JMPS, the mission-planning program used by many U.S. combat aircraft, Pyles explained. FalconView maps have been a part of the JMPS system since 2002. Now JMPS will plug into FalconView, increasing JMPS’ ability to connect to a number of mission-planning software tools. Thanks to an MFD/MPD emulator developed by the Georgia Tech Research Institute in collaboration with the Army Reprogramming Analysis Team, testing can now be done on ordinary laboratory computers.